JAMES MADISON. Newspaper. 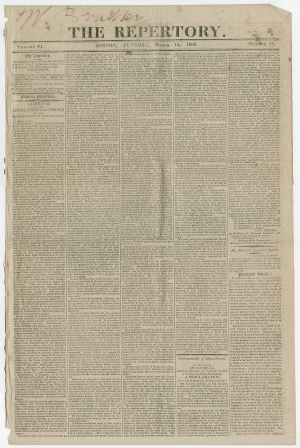 The Repertory, March 14, 1809. Boston, Massachusetts: John & Andrew W. Park. 4 pp., 13¼ x 20¼ in. Madison’s first administration was dominated by growing conflict with Great Britain over British impressment of American sailors and attacks on American shipping that culminated in the War of 1812. Although a supporter of a smaller federal government, Madison asked Congress for appropriations to increase the size of the Army and Navy. 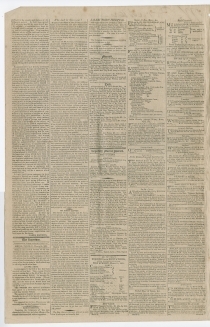 This issue also includes a lengthy address from the Massachusetts legislature to the people in opposition to the embargo system (p1/c1-4, p4/c1-2); a proclamation by lieutenant governor Levi Lincoln (p1/c4-5); an early editorial on the gubernatorial race between Christopher Gore and Levi Lincoln (p2/c2); and a variety of notices and advertisements. James Madison (1751-1836) was born in Port Conway, Virginia, and graduated from Princeton University in 1771. He entered politics in 1776 and played a major role in the 1787 Constitutional Convention. Later known as the “Father of the Constitution,” he authored the Federalist Papers along with Alexander Hamilton and John Jay. Madison helped found Thomas Jefferson’s Democratic-Republican party in opposition to Hamilton’s financial proposals. Madison’s served as Jefferson’s Secretary of State (1801-1809), and then succeeded him to the Presidency for two terms (1809-1817). Madison’s administration saw the culmination of Anglo-American tensions that resulted in the War of 1812, which officially began on June 18, 1812, and concluded with the Treaty of Ghent on December 24, 1814. The last years of Madison’s second term saw the transition to the Era of Good Feelings, as the Federalist party declined. When he left office, Madison retired to Montpelier, his tobacco plantation in Virginia. He also assisted Thomas Jefferson in the establishment of the University of Virginia, where Madison succeeded Jefferson as rector when Jefferson died. 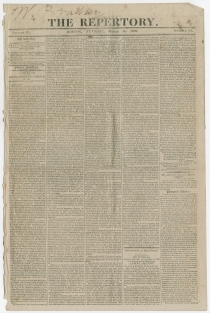 The Repertory (1803-1827) was a semiweekly Federalist newspaper first published in Newburyport, Massachusetts, by John Park (1775-1852) as the New-England Repertory. 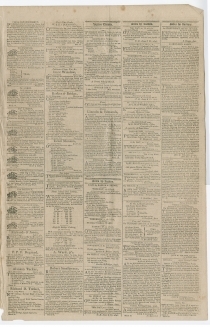 Relocating to Boston in February 1804, it became The Repertory and was published under that name and as The Repertory and General Advertiser until 1827, when it became the Boston Advertiser. 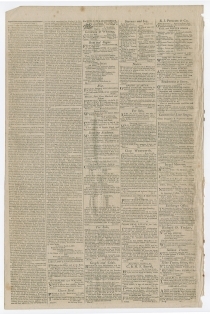 Initially published by John Park, his brother Andrew W. Park later joined him as a partner, and they sold the newspaper in 1811 to William W. Clapp, who in 1813 began the Boston Daily Advertiser as Boston’s first daily newspaper, while The Repertory continued as a tri-weekly edition until 1827, when its name changed to the Boston Advertiser.